Supreme Court hopeful Samuel Alito headed toward a Senate Judiciary Committee endorsement Tuesday as majority Republicans called him "one of the most qualified" nominees ever and Democrats warned that he could swing the court to the right. Before the panel vote, Republican Chairman Arlen Specter said he would be "sorry" to see a party-line vote but it looks like that's what there will be. The committee's 10 Republicans have already announced their support for President Bush's choice to replace retiring Justice Sandra Day O'Connor, while all eight Democrats were expected to vote against him. Specter, R-Pa., said he expects a final confirmation vote "by the end of the week." The panel's top Democrat said he wishes the president had chosen a nominee the entire country could support. Sen. Patrick Leahy, D-Vt., said there are "dozens upon dozens" of highly qualified candidates who would have gotten an overwhelming vote. Leahy said he believes Alito's nomination is part of the president's "radical realignment" of government power. Republicans hailed the federal appeals court judge as a mainstream conservative, CBS News Correspondent Susan Roberts reports. Sen. John Cornyn of Texas called him "one of the most well-qualified nominees ever nominated to serve on the Supreme Court." Added Sen. Charles Grassley, R-Iowa: "It's clear that Judge Alito did a good job responding to questions posed by Judiciary Committee members during the committee hearing process. He was thorough, candid and forthright." But Democrats were concerned about his past statements on abortion rights and his views on presidential power. "Judge Alito's record as a professional – both as a Justice Department official and as a judge –reflects something more than a neutral judicial philosophy," said Sen. Herb Kohl, D-Wis. He noted that Alito has refused to call the Roe v. Wade abortion rights decision "settled law." Alito's record "suggests a judge who has strong views on a variety of issues, and uses the law to impose those views," Kohl said. After the committee votes, Alito's nomination goes to the full Senate for a final vote as early as this week. 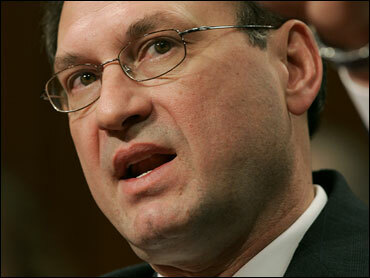 Republicans want Alito on the Supreme Court before Mr. Bush gives his State of the Union address on Jan. 31. Democrats have backed away from the idea of a filibuster, though they are expected to try to persuade as many senators in their party to vote against him as possible on the Senate floor. President Bush insisted Monday a filibuster for his nominee was not warranted. "There has been no sign of any extraordinary circumstance except for this extraordinary thing – he's extraordinarily capable of serving on the Supreme Court," Mr. Bush said. In recent judicial battles, a 10-8 party line vote would be the first sign of the possibility of a Democratic-led filibuster. But Democrats are not expected to try that with the 55-year-old Alito, a former federal prosecutor and lawyer for the Reagan administration who parried sharp Democratic attacks on his judicial record and personal credibility without a major stumble during his confirmation hearings earlier this month. Anti-Alito protesters holding "Oppose Alito, Save Roe" and "Stop Alito" signs lined up outside the U.S. Capitol, hoping to sway some votes as the Judiciary Committee began its meeting on Alito's nomination. Only one Democrat so far is supporting Alito, conservative Sen. Ben Nelson of Nebraska. Chief Justice John Roberts won the votes of 22 Democrats last year. By comparison, 11 Democrats broke with their party and voted for President George H.W. Bush's nominee Clarence Thomas in 1991. Thomas' 52-48 confirmation vote was the closest margin of success for a Supreme Court justice in a century. But few expect Alito's opponents to be successful. Most, if not all, of the Senate's 55 Republicans are expected to support Alito and most of the 44 Democrats to oppose him. Independent Sen. Jim Jeffords of Vermont has not said how he will vote.